In the late 70s/early 80s every collection of hard rock/heavy metal would include at least a few records by Rainbow. By 1979 the initial mystical/medieval-tinged lyrics had given way to more traditional rock content and original singer, Ronnie James Dio, had been replaced by Lincolnshire-born Graham Bonnet with whom they recorded the album Down to Earth. This turned out to be Bonnet’s one and only album with Rainbow. As a teenager this is one of the first rock albums I ever bought and was played very, very frequently. Sadly, Rainbow was one of the few big-name rock bands I didn’t get to see at the time. 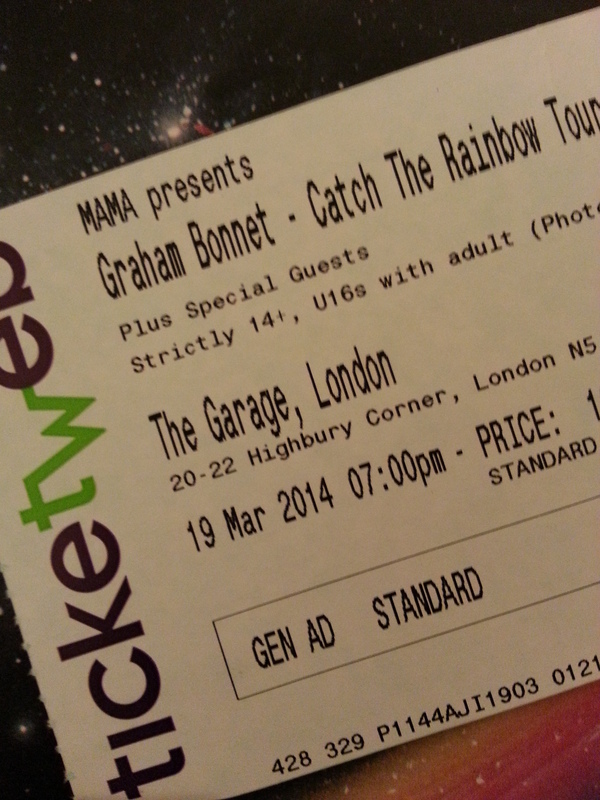 So the chance to catch up with Graham Bonnet performing Rainbow classics at the Garage in Islington for a very reasonable £16.50 seemed like a tempting offer. Of course, of the rest of the band who created the Down to Earth album, bass player Roger Glover has long been back with Deep Purple, now joined by keyboard player, Don Airy. Rainbow guitarist, Richie Blackmore, is now performing with his wife Candice in a medieval style minstrel band and drummer, Coz Powell was tragically killed on the M4. The only connection to the original band on stage tonight, therefore, was Bonnet himself, although Cozy Powell’s drum kit was did make a welcome appearance on stage and was used throughout the gig. As they were on the Down to Earth album, Bonnet’s vocals were powerful and melodic and a strong backing band delivered superb renditions of classics from that album. Certainly, the crowd sang along to them, particularly when Since You’ve Been Gone made an early appearance as the third song in the set. It was great to hear other Bonnet-era Rainbow classics, too, like Eyes of the World, Love’s no Friend and, of course, All Night Long. Good as Down to Earth as an album was, however, I did wonder whether there was enough material on it to sustain a whole gig, knowing this album was only a small albeit significant part of Rainbow’s total output. My fears were unfounded, though, firstly because the tracks on Down to Earth are so bloody good. And secondly, because Bonnet supplemented them with a couple of well-chosen Dio-era Rainbow classics: Catch the Rainbow and Long Live Rock n Roll. That nod towards Rainbow’s earlier history, presumably songs that Bonnet would regularly have performed with the band when he was in Rainbow, were very well received by the crowd, many of whom it’s fair to say looked like they had been followers of Rainbow through its many different incantations. North London is blessed with some excellent mid-sized live music venues, the Garage being just one of them, and if they continue to have rock acts on of this calibre it won’t be long before I’m back there, I’m sure.